What if you could get course credit for visiting your dream destination? Over spring break, Bryan School students traveled to Europe as part of two global business courses to learn more about international business, collaborate with local students, and develop a global worldview. Throughout the spring semester, UNCG Bryan School students collaborated on virtual teams with students from the Louvain School of Management at the Université Catholique de Louvain to develop business proposals. 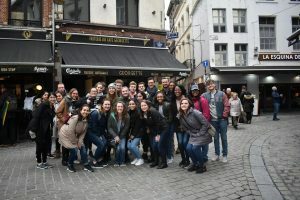 Over spring break, the class of 21 graduate and undergraduate students finally met face-to-face in Louvain-la-neuve, Belgium, to work on their proposals and explore the cities of Brussels, Antwerp, and Namur. In early April, the students from Belgium will visit Greensboro to complete their group projects and present their final proposals. 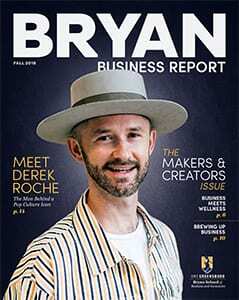 Bryan School students will take the lead showing students the area and teaching them about life in the United States. 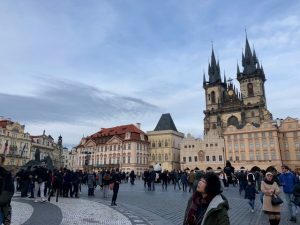 Nearly 600 miles east of Belgium, Bryan School graduate students had the unique opportunity to visit Prague as part of the course Doing Business Abroad. This one-week course provided students with on-site experiences to lean about business in the Czech Republic as well as the opportunity to meet public officials, business leaders, and Czech students. Jness Ogarro, a first-year MBA candidate, took advantage of this opportunity as she did not travel abroad during her undergraduate years. The students visited several companies across diverse industries in both the public and private sector including Czech Invest, a financial investment firm; Manufaktura, a skincare company; McCann, a marketing company; Green Fox Academy, a coding company; and People in Need, a nonprofit organization. One of the primary goals of the trip was to allow students to experience Czech culture and history while learning how to interact with people different than themselves.